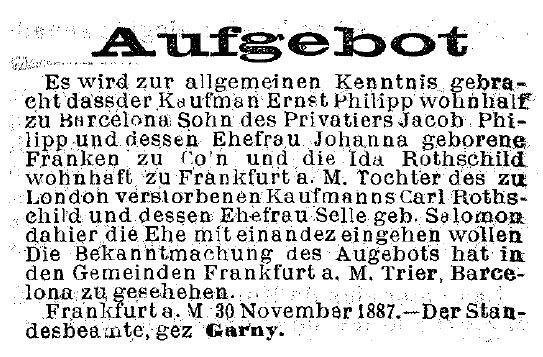 Genealogical Oddities (XXVI): A Rothschild line in 19th-century Barcelona? Rothschild is one of those surnames that rather leaps off of the page whenever it turns up unexpectedly in research. An entry in the index to civil birth records for the city of Barcelona caught my eye. 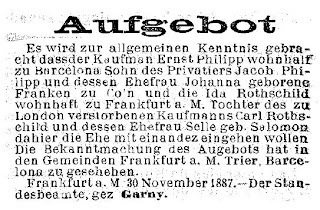 It records the birth in Barcelona’s University district on 16 February 1894 of Juana Elisa Laura, stated to be the daughter of Ernesto Philippe, aged 36, native of Wesel, and Ida Rothschild, aged 30, native of Frankfurt. The child’s paternal grandparents are named as Jacob Philippe and Johanna Franken, and Charles Rothschild and Lissete Rothschild. This in turn led me to a notice published 7 years earlier in Barcelona daily La Vanguardia announcing this couple’s marriage. The German text contains a few spelling errors and I think it likely that the typographer had no idea what he was being asked to compose. But the details of the bride and groom, and their parents, match the above birth record except for one point: the bride’s mother is named as Selle Salomon. Her husband, here named as Carl Rothschild, is said to have died in London (before 1887). I visited, among others, the excellent genealogy page on the Rothschild archive site, but was unable to find a match to this Carl or Ida. They note that ‘Rothschild was by no means a unique name and there were other (unrelated) families called Rothschild originating in Frankfurt’, so this may be the nature of the above record; on the other hand, the names and the references to both Frankfurt and London seem indicative of a link to ‘the’ Rothschild family. 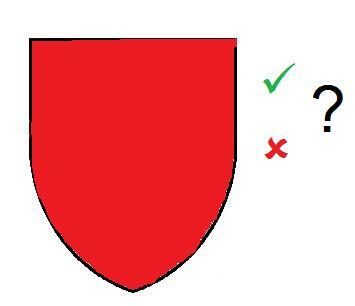 Red herring or missing link? Either way, a few minutes’ genealogical entertainment.